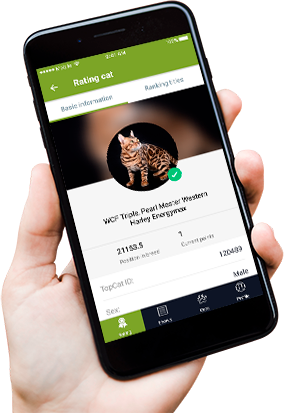 TopCat is a service designed for organizing and holding cat shows, as well as for automotion of composing of an actual rating. TopCat is now on your phone! Participate in rating, explore show schedule and apply for a show in just 3 taps! We salute the best clubs of 2018 rating season! Let us remind you that starting from 2018 not only maximum scoring clubs are awarded, but also those that also hold their shows on TopCat portal. 2. The club may apply an 1,5x point modifier to one of it's 2019 shows. To all winning club presidents we extend an invitation to a honorary banquet in Penza, April 13, 20:00 local time. We are glad to inform that TopCat becomes even closer to you and can now be installed on your phone as a handy mobile app. • Quickly update or edit your personal or cat's profile. Due to numerous reports and surfacing evidende of tampering with rating algorhythms, as well as unprecedented scale of point forgery, we have made a decision to multiply 2018 Fun-Show hosting national exhibition TopCat points by zero. 2019 Rating rules were changed to prevent this behavior in the future: https://ru.top-cat.org/help/raiting-calculation. I Adore to Give Presents!